IAQ provide complete cleaning, hygienic service and maintenance of HVAC systems. Clean coils not only reduce the likelihood of poor indoor air quality but also offer vastly improved system efficiencies and cost savings. Coil cleaning requires specialist techniques and skills to prevent further exasperation of problems. Recurring problems are often the result of inadequate cleaning of cooling / heating coils due to a “quick clean” mentality, which results in water spillage into ducts, poor drainage and inappropriate cleaning solutions, leading to a proliferation of mould and bacteria. IAQ employs systemised work practices, well-trained technicians and a strong attention to detail to ensure your cleaning is performed professionally. 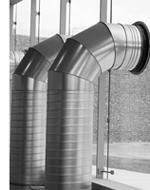 Duct cleaning is a specialist service that demands specialist equipment and expertise. For safe, fast and efficient contamination removal, this must be operated with knowledge of air duct systems and the required industry standards. IAQ use the latest Air Knife Technological Cleaning system, which requires far fewer access openings in the ductwork. This reduces disruption, technician time and cost compared to other cleaning systems. The main thrust behind the Air Knife Technology is high volume compressed air. Very few cleaning technologies operate with a tow-behind compressor. With a minimum of 150 cubic feet per minute (CFM) of air volume, it exceeds the conventional duct cleaning compressors by 500%. What sets the Air Knife apart is its advanced design, featuring a high-pressure air cleaning head. The head works like an air knife traveling in contact with the walls of the air duct throughout the entire system. Dirt, debris and contaminants are removed from the walls of the duct with speed and efficiency superior to any other methods. This dirt is simultaneously collected by a high capacity vacuum cleaner connected to the air duct channel. Air Knife Technology is not only capable of cleaning ductwork zones of up to 30m regardless of their dimensions, shape or form, but can also apply sanitizing and coating materials within the duct using the same procedure. Periodic cleaning is recommended for the Return and Supply Air systems, which consists of contaminant removal from the registers, internal surface of ducts, dampers, vanes and diffusers. Some s ystems utilise the ceiling space as a return path, which is known as a return plenum. In this case, our technicians will treat the ceiling space as a return duct. IAQ recommend that Air Handling Units (AHU’s) are thoroughly cleaned periodically to maintain a clean indoor air environment. This minimises restriction to airflow while maintaining maximum heat exchange between the air and coil surfaces, thus increasing running efficiencies and cost savings. All components and internal surfaces of the AHU’s are cleaned, including: fans, fan housing, belt covers, heat recovery plant, motors, dampers, outdoor coil, filter frames and condensate trays. The ventilation system is separate to the air conditioning system and consists of individual units for car parking, toilet and kitchen exhausts. Recommended cleaning regimes involve contaminant removal from internal duct surfaces, fan motors and blades, exhaust grills and kitchen hoods. IAQ Technologies is a team of professionals with extensive skills and experience in the air conditioning and mechanical services industry spanning over 40 years. We have experience in service management, electrical engineering and electronic air filtration in major air conditioning companies.